Hambleton Community Action are involved with a number of Forums and Partnerships. These are multi-agency meetings bringing together people who use services, their carers and representatives from voluntary and community groups and statutory agencies to exchange information and ideas to improve local services. This forum is open to all voluntary and community organisations operating in Hambleton. Share information on current issues and developments for the voluntary sector. Influence public agencies e.g. County Council, District Council and Clinical Commissioning Groups by inviting representatives to attend Forum meetings and through taking part in consultations. Provide information on sources of help for the voluntary sector. Create opportunities for networking within the voluntary sector. Forum meetings take place two times a year on Thursday afternoons in Northallerton. If you would like to attend a future meeting or further information please Contact Us. The Hambleton Forum for Voluntary Organisations is organised by Hambleton Community Action. This group is open to all voluntary and community organisations that provide health and social care support and work in Hambleton and/or Richmondshire. Create opportunities for working collaboratively and networking within the voluntary sector. Meetings take place two times a year, usually on Thursday afternoons in Northallerton. The Hambleton and Richmondshire Health and Social Care Collaborative is organised by Richmondshire Council for Voluntary Services and Hambleton Community Action. This forum is open to all voluntary and community groups working within mental health. One of the strengths of the group is that it includes service users (delegates) and carer representatives. 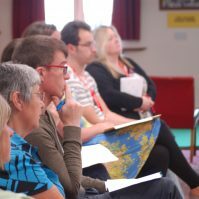 Forum meetings are held six times a year, usually on Thursday mornings at 10.00am in Northallerton. The Hambleton & Richmondshire Rural Transport & Access Partnership is a partnership of voluntary sector, public authorities, health agencies, service users, transport providers and community representatives. Enabling, developing and encouraging measures to improve accessibility for people likely to suffer from social or economic exclusion in Hambleton & Richmondshire. Identifying unmet transport and access needs. Influencing and raising awareness with regard to local transport & access needs. Promotion of the Rural Transport & Access Partnership and how it can support local people. The RTAP is ‘managed’ by a Steering Group who meet four times a year, usually on Tuesday afternoons at Stone Cross, Hambleton District Council’s offices in Northallerton. There is currently a vacancy on the Steering Group for a voluntary sector representative. If you are interested in developing improved access to services and better local transport provision and would like to join the RTAP Steering Group or receive our newsletters, please Contact Us. Hambleton Community Action is the lead partner for the Hambleton & Richmondshire Rural Transport & Access Partnership and provide administrative and officer support for the Partnership. The Hambleton and Richmondshire Disability Forum aims to bring together disabled people, their carer’s and the various support agencies to discuss key issues that affect lives such as access to health, transport, housing, discrimination, etc. Additionally, members from all the Forums based right across North Yorkshire meet regularly as the North Yorkshire Disability Forum, discussing relevant issues and looking for solutions to problems. The Forum has a social media presence where you can find a wealth of topical disability related information, news and ideas www.facebook.com/HRDisabilityForum. ‘Safer Hambleton’ is responsible for reducing crime and disorder, combating the misuse of drugs, alcohol and other substances, and for reducing re-offending across the district. Made up of statutory partners from the local authorities, police, police authority, fire service, probation, health and other voluntary and community organisations, the partnership is able to respond flexibly to the changing community safety landscape with local problem solving and shared projects. to reduce violence across Hambleton and Richmondshire and increase the reporting of Domestic Abuse to the police, voluntary and community groups. to reduce repeat incidents of domestic abuse by maintaining the ‘Making Safe’ scheme (a multi-agency initiative to support the victims of domestic abuse to remain safe in their own homes) at the same time as challenging the offenders’ behaviour. to share best practice and provide education and training for practitioners, by maintaining the ‘Champions Scheme’ across Hambleton and Richmondshire – the scheme involves a network of trained, supported and resourced practitioners across a range of agencies who act as the lead for domestic abuse in their organisation, giving expert advice on how to get help/support for victims.